Home/Podcast/Endless Coffee Cup Podcast: “What Are the Marketing Skills of the Future? Michael Stebbins, Chairman of OMCP, joins Matt to discuss the skills marketers will need in the Age of Automation. Michael brings data from the 2019 OMCP Role Delineation Study conducted earlier this year, as well as interviews with hiring managers. Though the study is not published yet, the finding support the trends that Matt sees in the field: Soft Skills are increasingly in demand! In addition, LinkedIn Talent Solutions just published their 2019 Global Talent Trends. Soft Skills are the top the hiring trends for 91% of HR professionals! Join Matt and Mike as they discuss training needs for future marketing professionals and preparing companies for the challenges of the next 30 years. Combining the soft skills with technical knowledge is more important than ever for a company to excel and get the most from their teams. Michael: All right, welcome back to the OMCP Studios. And with us today is Matt Bailey, author, educator, and CEO of SiteLogic. Matt is at the forefront of digital marketing best practices, training for some of the largest brands in the world. I’m your host, Michael Stebbins, and today we’ll be discussing a topic that Matt raised, what marketers need to know in the 21st century. Matt, as I pointed out, we’re kind of co-guests today. This will also go on “Endless Coffee Cup” but it will go on to OMCP. So welcome. Matt: Hey, thank you, yeah. I’m looking forward to this. It’ll be a dual-purpose podcast. Michael: Yeah, a little bit different format. In the past, you’ve helped us out with best practices, but today it’s a little bit more of a discussion. Matt: Great. Let’s get on it. Matt: Wow, you did your homework. Wow. Hurrah. Michael: Well, it’s an honor to be on “Endless Coffee Cup.” So tell me what some of the constraints are, where do you want to fit this in, what people need to know, what they need to do, how they need to think? Matt: Okay. So let’s start here. If I am in charge of a team, an agency, a department, how do I prepare my employees or how do I look for prepared employees? I think that is the context that I am looking for. Michael: And again, the consistent cry I hear from hiring managers is, “I can’t find qualified people.” That’s a great intro to start talking to folks. So the first thing I want to pull out centers around the value of a liberal arts degree or a theatrical degree being a criteria that more than two hiring managers are looking for. And she said, “One of the things I look for when I interview somebody is I ask them to go to the white board and present something. Draw a circle, draw a graph, represent and show us that you know how to persuade and communicate.” And so while, you know, you and I were…I know at least I was expecting to get into the nitty-gritty, you know, like, tag management, and event-based tracking, and, you know, but just as an overview. And because it’s so recent now, because that was years ago. In today’s conversation I recalled that story to the hiring manager I was talking to and she had the same strong reaction. She says, “I want people who I can put in front of the CIO. I want people that I can have influence other managers.” And so this goes into the soft skills that you and I covered in the past. While somebody might have the tech capability and the logical or analytic processing capability, she is also looking for people who can translate that into internal influence and the ability to persuade within the organization. And now I should make sure that I state that these conversations were with people at very large organizations, thousands of employees, and may not relate quite as much to somebody who’s doing this for a smaller team. But still, ability to persuade. Matt: Yeah. I’m gonna say it’s gonna work for a smaller team, too. Because when I had my agency, I mean, I remember being frustrated at the hiring process. And I flat out said, “Just give me someone who can communicate well, through writing, through speaking, I’ll teach them everything they need to know. But what I need is someone who is comfortable in front of people, can put together a couple of words and make a competent sentence, and not embarrass me when they’re in front of someone.” That’s all I wanted. And so yeah, I would say, looking back now, the vast majority of people we hired came from liberal arts education. I myself came out of a liberal arts education and I can pull from a number of areas and I do throughout…I would say throughout my career and even, you know, somewhat recently, I kind of pull from those areas to help inform things that I’m working on, things that I’m developing, whereas the few people I hired with technical skills were limited in their mobility, were limited in what we were able to do with them because that’s where they were comfortable, and they wanted to stay there. Michael: We were setting up sound check. You used the phrase critical thinking, does this align? Matt: Yes, yeah, critical thinking, because it’s that ability to see beyond what I’m doing right now. It’s the ability to look at the business processes. I call it business acumen, and that goes even into, you know, when I’m training people on analytics, that analytics is not about numbers. Analytics is being able to tie an event to profitability. You know, am I losing money, making money, what’s happening? And the best analytics are the ones that bring in that business acuity, and can know from looking at the data, this could improve your business, this is damaging your business. And so they were able to bring that in but it also takes that presentation skill to enable someone to see how it’s happening and then get the buy off on, “Here’s the change we need to make.” So that critical thinking skill of bringing in business acuity, of really just taking that step back, and asking I’ll say the best question my best analyst ever asked, “How do I know what I did just worked?” That’s all I want. If someone takes a step back from their everyday job, what’s it doing? What’s the payoff? What good is this doing? That tells me they’re ready to go to the next step. They’re starting to think critically about what they’re doing rather than seeing it as a 9:00 to 5:00 job. Michael: And tying it in even to micro-steps and decisions that lead up to the profitability is a key skill that folks who are entering some of the larger enterprise businesses need to learn very quickly. They would have no exposure to profitability numbers, but certainly, might have exposure to a decision that needs to be made. So if I can, I’ll give an example of something I recently did for a client that related to the writing team. And the writing team at this very well-equipped enterprise organization needed to do a little bit of branding and positioning. So the request was formed, hence they thought they were being dutiful to the SEO criteria, they came and they said, “We are going to rebrand with this new phrase, what keywords should we use?” And now, you chuckle, okay, and a good consultant learns to bite their lip. Matt: See, I don’t have to do that right now, but I know where it’s going. I know exactly where we’re going, I’ve seen this. Michael: Yeah. And so you’ve got to start by first congratulating them and saying, “First off, well done, come into the SEO team now instead of when [after your content] is first published,” so, you know, you reward this kind of behavior. And then comes a decision, what measurement would be most applicable to enable this team? Okay, and so right now, currently, we know that the algorithms are looking for what we would call dwell time for search, right? And the words that sticks around, that’s a signal that the content is relevant. And probably, the AI engines are a lot more advanced to where keywords are not…you know, on-page signals are probably not as important as links and authority links and dwell time. So how do we measure something that helps the writing team understand that? So what we did is just…well, actually, what I did just in a geeky moment inside of Google Analytics is I went and set up dwell time and then I pulled in some backlinks from SEMrush with a little algorithm that, (you know, Dr. Turner from ClickTracks’ fame would probably choke on it)…but it was a rough calculation of a combination of the value of links and the combination of dwell time on the page and then we added in scroll depth. Did somebody scroll, 50% or or 80%? And we put those together and we assigned scores to the engagement for each author. And so I used Screaming Frog to extract the Schema data. So I knew who the author was, and then put this all on a spreadsheet and pulled it together. And the result was just a very simple engagement score that goes out every week to the writers to say, “Hey, this is the top scoring author for the week in terms of engagement.” And so it’s enabling a decision, right, will I write my content to what my readers really want or am I going to write it with a bunch of gateway keywords that try to fool the engines? And so, in this case, we’re trying to steer the behavior a little bit. And so I would say that that type of process that I just described would be something I would expect to be intuitive to somebody who wants to be successful marketing in the 21st century, right? Matt: Absolutely. It’s seeing beyond that initial scope, it’s looking to see, again, yeah, how do I measure this? What am I really trying to do? We make jokes about these companies that say, “Well, we need to make three Facebook posts a week.” And that is a prime example of not sitting down and saying, “Well, what are we trying to accomplish? You know, what do we want people to do? And are we meeting some sort of need out there?” So it’s a great skill of just simply looking beyond the tactic, and coming up with methods to look at what are we truly trying to accomplish here, how do we accomplish it? How do we measure those means of accomplishing? I love working with writers, especially, in that type of environment, and we did something very similar. We created a matrix of, you know, writers that…I think we looked at it like a weekly and a quarterly, that those that brought in the most new visitors, and those whose articles over time…like, we had a running board of whose articles had generated the most visits. So even look at it more kind of a macro scale of, you know, with engagement, but also driving numbers, because this was a publisher that was ad-supported, so page views, you know, equal money. And so it was one of those things where, you know, very similarly it’s let’s come up with a way to motivate the writers, you know, almost gamify what they’re doing in order to drive that. But, yeah, I think that’s a great example of looking beyond the tactic and looking at the business of what we’re trying to accomplish. Michael: Yeah. You know, then we have this issue where if everything’s important, then nothing’s important, right? Michael: It’s a little bit…just looking at the balance of this, as hiring managers are looking for all these tech skills and all these presentation skills, you almost need a super human to do this, right? Matt: My favorite story, Mike, is when I went to a company and I trained them on analytics. And they invited me back a couple of months later and they said, “Well, we’re going to hire two people for analytics and we want you to help us write the job description.” So it was kind of cool, you know, got to hang out with everyone again, and what they started coming up with about half way through I had to stop them. And I told them, “Look, I’m not qualified for this job because I don’t have the requirements that you’re developing to create this.” I said, “And most of the very good analysts that I know of, that I know could come in here and within a day make an impact, they’re not qualified based on what you’re proposing.” They’re looking at a degree in computer science, a minor in mathematics, and they’re putting together all these technical skills and I’m trying to get them to understand that that’s not…you know, you just got motivated from an analytics course where I taught you, you know, it’s not about the numbers. It’s about the analyst. It’s the analyst’s ability to put together these things, but they just got right back into that thinking of, “What are the qualifications? What kind of education do they need? How many years of…? You know, all those things are important, but do they point you in that right direction? Michael: Correct, and can they curate the skills or know how to drive a specialist? I think that’s a reasonable goal, that if I bring on somebody who can be influential and has these soft skills that I’m looking for, has the ability to persuade, can practice critical thinking, can teach themselves, at least, the concepts of digital marketing skills, can they, at least, tap specialists when they need to? For example, if I needed to extract certain measurements through Adobe Analytics or some analytics tool, I may not know how to set up the tag management or the event push, you know, on each page. Matt: Yeah. Well, it’s the ability to scope it. You know, I don’t know how to do tag manager, but I know who to talk to and I know how to scope what I want done. Now, that brings up another issue because in working with another very large worldwide company, one of their biggest issues is creating briefs, is developing scope, they get tasked with developing a campaign and they put together a very basic brief that goes to the agency or to a specialist. And it is so…you know, I’ve seen a few of these and they even said, “We’re terrible at it.” And, you know, it’s a garbage in, garbage out proposal, that this brief is so wide open, so general, non-specific, does not identify specifically what we’re trying even to accomplish. So when the agency replies they just reply with some boilerplate stuff and put a number in, and it’s like no one knows what each other wants to do. We’re going through the motions, and so, you know, I’ll add that into the skills, as being able to scope. And by scoping, you understand the technology, not so much in a practitioner’s sense, but in a manager’s sense. I understand it enough that I can scope it out and competently explain, “Here’s what I want done, here’s my objective,” you know, and then be able to assess the work after, that it’s doing what we wanted it to do. Matt: It’s data. Everyone loves data. Michael: Yeah, but they glaze over. It was the most interesting thing, you know, because I sit in on these, right? That’s typically one of my engagements as a consultant for talent development, and I’ll listen to the agency present to the stakeholders, right? The stakeholders would be be a product marketing group, an MIP demand gen, who knows, right? And, you know, I don’t even see them…I like having a camera on, typically, in remote meetings, but a lot of these folks just don’t do that and you almost can hear them glazing over. At some point, they just stop asking questions and you kind of hear this slight typing in the background, they’re trying to keep it quiet, checking e-mails. It is just enduring. And, Matt, I know you do the same thing, right? I end up the meeting, I’m like, “Stop, I just want… On a scale of 1 to 10, you know, with 10 being, “oh my gosh, this is so actionable, I can’t wait to get off the call and start acting on this”, and 1 being, “I have no idea what you said. It looked like everything’s up into the right and I’m moving on.” What level are we at? And is it one, two, 1.1, zero?” Right? So, you know, at that, point, you know, you’re diplomatic and you tell the agencies, “Look, there’s no question you guys know what you’re doing. No question of your knowledge. You are not delivering what these people need.” You know, sure, there’s 5,000 pages getting dropped because of mobile first indexing, right? Presenting a list of those to the product marketers doesn’t help them a wit, right? Michael: But if you rank them by backlinks and give them the top 10 to the web team instead of to the product marketing team, and say, “Look, all these pages need to come back, but we recommend starting with these top 10.” I said, “Now, you’ve got meaningful data, you know, that they can be acted on.” I got to admit, Matt, I mean, you know that both of us have an entrepreneurial background. When we would do something like that we would simply act on it, right? Michael: You know, and it would get done in a day and that would be it. But their new regime now that it’s very valid and it’s not something…I mean, it’s, you know, after a beer or two we might mock it. But I think really, it’s wrong to do so because a lot of the constraints at these larger organizations are very real and very necessary. You know, GDPR, “When do we serve the cookie?” And, “Can we start implementing analytics before we get permission for the cookie?” And these kind of constraints, you know, you smack your forehead, it’s like the web team’s going to take, you know, four weeks to get to these. And yet it’s real and these are…and you don’t assign the obtuse feeling to the people, you assign it to the fact that it’s a large ship that takes a long time to turn. And these are very smart people who are trying to do the right thing, but they have to check a bunch of boxes and rightfully so. And so I think I want to put that on the list right now, is that the mindfulness of the constraints of the organization is going to be a top skill in the 21st century for a marketer, if you adapt the digital marketing initiatives and measurements to enable that team to make steps forward. Matt: That’s, yeah, excellent observation. Excellent. Michael: Yeah, and it’s I think…you know, and smaller businesses know. You know, Jessica Bowman, our good friend, Jessica, who’s an in-house SEO invited me to chat with some of the other in-house SEOs who were attending in SMX West, in San Jose, and we had a great session. And (without revealing who some of the clients were) I revealed some of the constraints that we were dealing with. And I’m looking at this crowd and all of them are looking at me with their mouths open, like I just dismembered a kitten, on the screen, right. You know, it’s, like, right in front of us like, “Yeah, this cat’s going to be torn apart.” It was just mouths dropped open, eyes open, dead silence, … And then [one seo] said, “We thought we had it bad. We had no idea that somebody was under those kind of constraints.” And he said, “I feel much better now.” And it’s like, “Yeah, but is it because the organization is dimwitted or slow?” You know, NASA’s technology has to take years for adoption and approval. So I think that’s a very important thing. Matt: It is, and it’s… One thing you said there that it was very… Yeah, it’s easy to mock, and even within the organization, it’s easy to mock. And so, you know, I love that, understanding the constraints in the organization. That is big because there are things that just completely out of your control. And again, to come back a little bit to some of the persuasion, but one thing I have seen and I’m…there is a large business right now that is breaking down a number of tasks, a number of channels, they’re creating small teams. And on this team, you’ve got a designer, an analyst, you know, so, for example, they’re going after paid search. And they’ve got someone who’s managing the campaign, someone who is looking at the numbers, looking at the results, they’ve got a designer who can create pages on the fly, and this small team is…they have the go ahead to make decisions as necessary. That you are responsible for generating leads and here you go. And now, you know, you take away, you know, the whole process, the approval process, the…you know, and they’re working together throughout the day, “Let’s try this creative, let’s try this call to action.” And they can try different things, they’re all working together, and they were telling me that the speed of implementation and how quickly we’re overcoming these, typically, past obstacles, they are getting excited about that. And so now, they’re developing these little team concepts in larger scale. So going to the website, you know, now, we’ve got a little team that’s focused on user experience, and they’re measuring all the task completion across the entire organization’s website. And they have permission if something is wrong, you know, we want you to fix it, you know, or tell us what’s wrong, why it’s wrong, things like that. So I think organizations have realized that these are things… Also, you know, your smarter larger companies have realized that there are obstacles, but we need to sit down and figure out why those obstacles are there. And if we can’t come up with a good reason, then we need to address it. Michael: Now, these teams are, you know, special temporary teams or is it their sole responsibility, how are they structured? Matt: They’re structured around campaigns that are happening, but at the same time, it’s becoming much more dynamic and fluid where, you know, it started out just with paid search. But then it broadened out that, well, it’s paid search and now it’s getting into retargeting. Well, now, it’s getting into programmatic. Now, it’s getting into… You know, so it just starts bleeding into other areas as they see the results coming. They’re giving them more and more leeway, so it started small but by demonstrating competency and by demonstrating results they’re getting more freedom. And so now, you have teams kind of competing against each other, you know, as far as results or, you know, in different campaigns or in different life cycle areas for customers. So it’s a fascinating thing to see. Michael: You know, that kind of an approach and I know there’s some terminology, you know, some people call it agile, or a different way of forming these teams I’ve seen be extremely effective. I don’t know if there’s…I would hope there would be some type of resource that’s out that we could direct people to that would describe how to set up and manage a team like that, whether it’s a temporary functional team or whether it’s a second responsibility that crosses, you know, division boundaries, right? Michael: You know, in one group that I was working with last year, they had separated Google Ads and, basically, what they called search, but it was, you know, basically, pay per click from the…you know, what they called a programmatic in media advertising. You know, it’s just basically LinkedIn and Facebook targeting. And it was really odd because they were requiring their stakeholders to create a landing page, you know, for the media and the programmatic, and then the search team was going to the stakeholders and asking for a landing page for paid search with all the, you know, Marketo tracking tags and things like that to keep it separate, and the channeling to Salesforce etc., all had to be…and then they would make their banner requests. And a good display campaign on Google Ads is going to require, I believe, it’s no less than 14 different sizes of banners, you know. And then their requirements are different, right? We can’t have a “Download Now” button because, you know, a form, you know, so it’s going to get rejected, and then you need blank ones for the response of ads. And, you know, the other team was going on the criteria for Facebook or for LinkedIn or for other programmatic banner sizes, and what happened is the stakeholders would get overwhelmed and with all these media requests and the landing page requests and, oops, a tracking tag to go in, that they would back away from one and not finish it. And so you would end up with a campaign now that only had ads from Google Ads or only had ads for LinkedIn or something like that. And they would mess half the boat. And we all know how well half a boat does, right? So, you know, we’re watching this happening and it’s, like, as an organizational structure, your team concept that you just came up with would cross those functional boundaries and come up with, you know, like a Marty Weintraub, let’s chase the cheap cookie, right? Michael: And leverage that through psychographic targeting. (We love you, Marty!). And end up with a targeting system that gets the cheap cookie and then creates custom audiences to chase them based on their criteria. That’s a coordinated effort that crosses those silos and gets it done. You know, and so here now, we need skills and this leads to another skill that I’m seeing more in the short term, is the data management platform skill in the marketing stack. Do we know how we’re going to handle the incoming data and be responsible with it? And I think this is an important skill, at least, for the next 8 to 10 years, is how am I being responsible with the data that we’re gathering, and am I managing it properly and efficiently, you know, by regulations and rules that we must adhere to? Matt: Oh, I understand, yeah. Michael: …and now you have a practitioner who, if the company or the entity is going to move, right, if they’re going to be effective there has to be oftentimes a very persuasive, you know, call to unify these things. You know, if you do one landing page we can request the overlap on the banner ads at the same time, and we can come up with a data management process, and then submits that to the management along with the business case for taking the time to even look at it. So while it is a manager’s responsibility, I’m finding that a lot of the managers are dealing with internal processes, funding, procurement, hiring, and they don’t have time to stay up-to-date on this stuff. And it’s the persuasive practitioners who are luring them to the problem and hopefully doing it with a solution. Because what do they say? Writing the problem without a solution is just complaining. Matt: Well, that gets to another area. I’ll add this to the list. It’s integration of disciplines. You know, one of the things I preached at my agency is that you’re gonna learn a basic set of skills, and then I want you to find what you love, and when you find that, you know, I’ll give you the tools to flourish in it. Maybe it’s content development, maybe it’s analytics, maybe it’s design, you know, you’re gonna grow in those areas. But I don’t want you to forget where you came from and forget what you learned, because you’re gonna do other things. You’re just adding to your arsenal of what you can offer. I think this is a valuable skill. Honestly, let’s say it this way, if you’re a one-man shop, you have to have that. If you’re in a small agency, small business, you’re wearing all the hats. You’re getting into a larger organization, and I’ve run into this in training at large organizations. People get…they’re hired for a specific skill, let’s say SEO. And I’ve run into SEOs before that have said, “My job is just to increase rankings and that’s it.” And, you know, I’m kind of like, “Okay, you’re really limiting yourself here, because if you don’t take it upon yourself to learn how you integrate with all these other disciplines you could be out of a job very quickly.” And I’ve seen that happen, where even training at larger companies, some people will come into the training thinking, “I don’t need this. It doesn’t affect me. It doesn’t touch what I do every single day.” And as a result, I have seen some of those people not there the next time I go back, because the company is investing in this training to give you this broader sense of, “Here’s how everything works together.” And those that embrace it and learn it, they’re the ones getting promoted, they’re the ones, you know, identified as rising stars. They’re the ones that the company sees this is who we want to promote into management because they understand that big picture. The more they understand it the more valuable they are to the organization. Michael: And you’re alluding to something that I want to be much more concrete about, which is last 15 years or so watching companies invest in training, there is an uncanny correlation to the people who initiate the training and the people who get promoted. Michael: You can just kind of…you know how you just kind of start counting down, three, two, one, promotion. And you just see it over and over and over again, because they’re the ones who reach out to you. You know, “Hey, man, I’m researching training for my team. I just feel like we need to do this.” “Well, are you the manager of the team?” “Nope, I just think we need to do this. And I have asked the manger to do it, and they’ve given me the okay.” That person within one year is the manager or the director or the VP. Matt: They see the value, absolutely. They see the value and I think they’re making a great case that as we get trained in these things, you know, here’s the payoff that we can internalize much more. We can manage much more. That’s another thing, you know, I wanted to bring up to you as well, is just the… I sent you an article about a week or two ago on the increasing trend of companies pulling more work in-house. And becoming…not that they’re ending the relationships with their agencies, but they want the skills in-house to better manage the agency relationship. And so there’s a big need right there, is we need to train people to ask the right questions, to understand these reports, to give feedback, and those people that are cross-training, that are developing those skills, you make yourself a more valuable employee. And, again, it comes back to that business acumen. You’re contributing to the overall value and you’re a value to the company. Michael: You know, you mentioned earlier too that cross-discipline training or cross-discipline knowledge is required. Obviously, one of the primary responsibilities of our industry association, OMCP, is to make sure that they poll hiring managers and practitioners as to what are the hirable requirements. And I wanted to share, if you’re willing, just some of the initial data that came in from the 2019 role delineation study, I have preliminary data. It’s like a playground, Matt. You know, cross-segmentation of the data, and oh, this is interesting and, oh, that’s boring. That is not interesting. But I wanted to just read the top. So there’s 1, 2, 3, 4, 5, 6, I don’t know, maybe 9 or 10 disciplines that made it onto the survey. 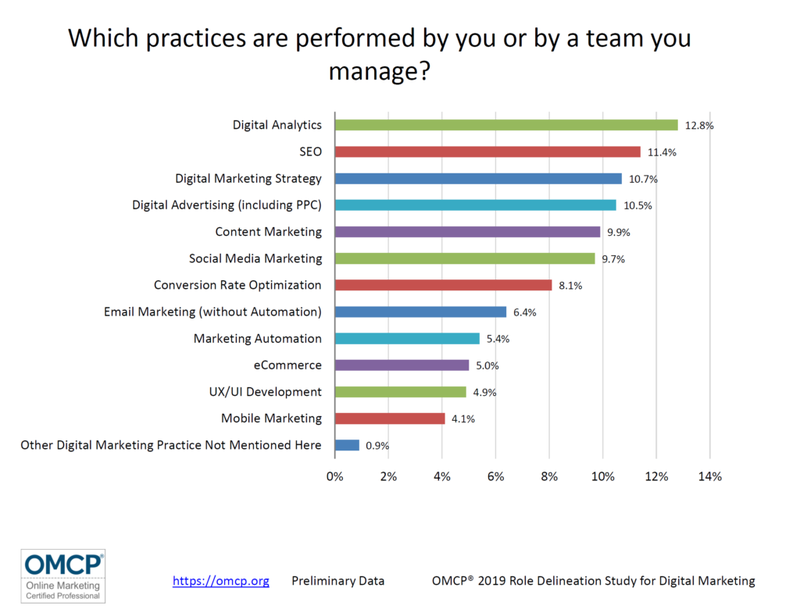 #1 digital analytics is by far the most popular practice. And number four, content marketing is next, social media marketing, then conversion rate optimization, e-mail marketing without automation came in at 6%, marketing automation next. E-commerce 5%, UX/UI development made it onto the list this time. I think that we may start putting conversion within that group. And last one was mobile marketing as a standalone. We’re starting to see that be required in the other disciplines. 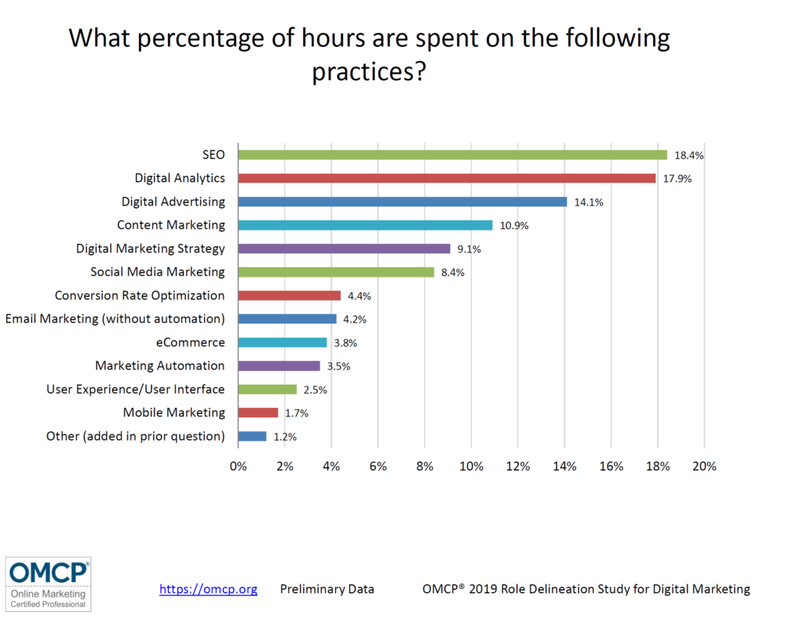 Now, that is asking folks, “which practices you perform.” When it comes to the hours, it was a slightly different skew with SEO edging out digital advertising just ever so slightly. But the things that I’m naming, SEO, digital analytics, digital advertising, content marketing, social media marketing, conversion rate optimization, UX/UI, all critical to, at least, have what we call a conceptual understanding in the ability to articulate what needs to be done in each of those as a minimum for somebody in the marketing career. OMCP requires five of the eight, right, five of the eight that I just listed as a…you have to pass the exam, understanding five of those, and this is what hiring managers tell us they need. For the professional, which is somebody who is implementing and practicing, you know, rolls up their sleeves, the name of the practices part of their…we like to say it’s part of their title, right, it’s on their shingle, whether it’s for in-house SEO, or an in-house analytics specialist or consultant. Two, minimum, hiring managers said, “For somebody to come into practice we do not want somebody who just knows paid search.” They must also know one of the other disciplines. So paid search and digital analytics, or paid search and conversion rate, or paid search and social media and combined. So they need that baseline and those two. And then if I’m not going on too long, I wanted to share with you the education requirements that they came back with. And this is where I was surprised that there wasn’t a whole lot of variation between hiring managers. The hiring managers said that the experience required for what we would call an associate or somebody who is a general marketing practitioner is 47% said that they want 2 years of experience and 26% said they want 5 years of experience. And 10 years plus was only 3% of the hiring managers said that they were looking for 10 years plus. Michael: That’s true, or late adopters. Matt: Yeah, yeah, so it’s 20 years old. The education system has simply not caught up in preparing people for digital marketing. I mean, the vast majority of my training is internal staff who have been hired to do this, but they have not learned to do it. They may have gone through a marketing program, or have a marketing degree, but to set up a paid search campaign, they’ve never done it, never seen it, have no experience with it. Matt: Or, you know, it comes back to, like, my best story of a guy I hired, four-year degree in, you know, I think it was website design and marketing. And two weeks after working for me he comes in and says, “I feel like my degree’s been a waste.” And I’m like, “Whoa, wait.” I’m like, “What’s the matter?” He says, “They never taught us how to make money.” He says, “And that’s all you talk about here, is what are we doing for our clients? How does it make money? What’s it driving to?” He says, “All I learned was, you know, how to write a web page, but yet the web page I was taught to build in school had nothing to do with a call to action. It had nothing to do with the purpose of the site.” And that’s where I think the education system is attempting to get better but, you know, we are bringing in new hires in organizations that simply are prepared to be a practitioner. And so now, it’s on the organization to do the training. And now, yeah, especially, you know, from a management standpoint, I’m looking at experience, I’m looking at what have you done, even before when I had the agency, I used to call that your basement experience, you know, what are you building on your own? What’s your passion? What are you doing? It doesn’t surprise me because I think especially in online marketing and digital marketing these areas, no one’s teaching it, you know, in a structured…you know, there are some classes, courses, things you could take, but the people that know it are either doing it or they have taken it upon themselves to get trained in it and become familiar with it to make themselves employable. And so then, if I’m looking at management, I want people who understand how it works, and how to train, and how to work within a company to do that. So no, that doesn’t surprise me at all. In fact, I think, honestly, in this area, I think degrees will become less important over the next 10 years and maybe further, especially in this area. Because it’s so dynamic that textbooks can’t keep up, and as long as a textbook is the primary means of instruction those who are going to a four-year degree at university to do something in marketing, unfortunately, may be behind. And that’s a scary thought. You could be putting yourself further behind someone who gets in and starts practicing, that starts setting up maybe their own business. Because now, they’re coming in with two, three, four years of experience and they can talk the talk. They know what it does. At the same time, and I’m gonna kind of even back up a little bit further, what you talked about where there are these core set of skills that are absolutely necessary, you know, as opposed to, “I’m gonna focus on one skill and specialize in this.” You’re cheating yourself because they all inform each other, and that’s what I love about this business, about this industry, is that you need SEO because the skills in SEO will spill over to paid search. They will spill over to content development. They’ll spill over to, you know, social. You know, they affect so many other areas. Same thing in conversion, it’s needed everywhere. You need to approach all these areas with conversion. And that’s what overwhelmed me when I was going through all of the individual disciplines. One of the thoughts that occurred to me is, like, I’d love to see what’s the skill base set that would apply to 75% to 80% of every individual skill within OMCP? I’d love to identify that, that base set, that if you’ve got this, you’re 60% of the way in every individual area. Michael: What’s an example of one of those? Matt: Keyword research, because keyword research shows up in the exam, it shows up in the competencies for SEO, for paid search, for content, for analytics. Analytics comes up in every one of them. The ability to set measurements, and apply those to the campaign, and derive then success failure adjustments so that analytics piece is a part of every individual discipline. So that was what was occurring to me as I was going through each one of those, is there is that base level and the more you broaden, the more it informs every discipline. And it makes you stronger in the one you’re working in now, but also just when you see how it all works together, it’s like that…you know, the clouds parting, the sun coming and beating down, and angels singing. Because now, it’s like you’re in the matrix and you’re seeing all the numbers, and how they work together. And yeah, yeah, you know, you’re neo in the matrix, able to control so many things because you have that cross-discipline approach of how everything is rooted together. Everything has, you know, that same base and when you operate from that, man, it makes you a powerful, powerful asset. Michael: But you have to, and I’m hearing this from every hiring manager. You have to. More than spills over, it absolutely requires it. I mean how could you do SEO now without getting involved in the content strategy? You can’t. You just can’t. And so go study Lee Odden. Great content marketing information there and learn the practices of deconstruction and sourcing the material. It’s brilliant stuff and you, at least, need to understand how it’s done because, typically, in a lot of organizations you’re going to run into terrible content, right? Matt: Well, and it’s very interesting because over the years…you know, I’ll go back to the very beginning. SEOs were in two camps, writers and programmers. And I remember a well-known at that time SEO really downgrading the writers. That, you know, what you people do, you know, all you’re doing is just putting a keyword in a sentence that the real work is done in the programming. And, you know, now, fast forward 20 years, and I have next to no requests for SEO programming, you know, because in most organizations, the people in charge of content, of SEO, of any of that have nothing to do with the programming. They don’t touch, they don’t see it, they don’t deal with it, and SEO now, has had to evolve into content writing. You’ve had to evolve. So an intimate knowledge of a couple of agencies that compete, and one of the things that they tell me that absolutely drives them bonkers is they’re developing the content, they’re creating the strategy for the company, but then there’s also an SEO company involved. And they get the content and they change it, and they put keywords in, and it makes it clunky. And so, you know, now, you have these strategists that are coming at this content development and now there’s an SEO that all they’re trying to do is plug keywords in. And oh, my goodness, does it lead to just almost absolute wars between companies. And then, you know, somebody’s in the middle saying, “Can we just get this done?” You know, that’s the difficult part of where we are and where things are progressing and moving towards. And watch out for companies just getting passed up because they are approaching things in that very narrow tunnel vision type of approach that I just need those right keywords. Back to the very thing you started with. Yeah, here’s our strategy, what are the keywords? Michael: One of the things that I have encouraged the SEOs that I have worked with to say as soon as that happens is, “Write what you need to write to reach your audience. Forget keywords. Forget it. Write something that is so compelling…” A question I like to ask is, “What question does my content answer better than anything else on the web?” And if you can get the writer to answer that (and boy, it’s like pulling teeth), but instead they’re saying, “Oh, well, I’ll get some words out on there on the page.” and the SEO response is, “Okay, well, then it will probably be ignored because it’s just platitudes.” You know, my thing about platitudes, right? You could take that and put it on a web services page or a cloud page or a security service, or whatever you want. It’s going to mean the same thing. So get rid of it. You know, one of the interesting things when I asked a fairly senior hiring manager in one of the world’s larger consumer marketing groups, what she was looking for, and I think the first thing because I said 21st century, she goes, “Okay, you know,” (something that John Marshall and I and you always used to say) “Look, you can’t predict what’s going to happen five years out…. You know, in some ways, this group never dreamed what Facebook would do for their organization, five, six years ago. And yet now, it’s key, and what’s going to be key in, say, five years from now?” She said a lot of the millennials don’t have any idea what MySpace was, but that was a big deal [12 years ago]. Michael: Right. But I wanted to reflect because she took the time to share a few things. I’m just going to parrot those out. I think they’re useful. Besides digital marketing, see, now, that’s kind of like the given. Besides digital marketing, she’s looking for: People who know how to stay up on the consumer trends and know where the consumer is, what they need to hear. Okay. And again, this ties into working with the content teams. What questions are your target audience asking? What phrases do they use to describe what’s familiar, disturbing? What do they want to achieve or avoid? And how can we work those phrases into what we do with genuine answers, right, that are better than anything else on the web? Next, she wants people who can see behavior trends, where are the customers going to be? That’s what she argued for. And then, several times she pointed out, and I’m sharing the things that resonated with other managers. So this just isn’t one person’s opinion, I’m hearing this over and over again. Matt: I’m hearing the same thing, yeah. Michael: Agile learners. Keep up your skill set. They want to see signs of that, are you keeping up your skill set? Do you have a history of keeping up your skill set? Are you able to learn and adapt quickly to whatever the next thing is? You know, and, of course, what I loved to hear from this particular manager was she’s specifically looking for OMCA and OMCP certified, but she added something that I…it ties in with what you said just a moment ago. Those are industry certifications. They show that you have general practice knowledge, but then there are platform certifications, which I think are very important Don’t confuse them and that’s a mistake. But hey, I know how to use Adobe Analytics. I got trained on how to use Google Ads platform. I got trained, okay. Those are… HubSpot. I mean, all these… Yeah, okay, they are lead generation for the company, right. You know, they can pitch to you, but it doesn’t mean that they lack value. They have them. A lot of people who get the industry certification versus the platform certification kind of wait for me as an OMCP representative to denigrate it, and I absolutely do not. In fact, OMCP gives renewal professional development units credit for platform certifications. We’re that excited about them. So I think that’s another point that I wanted to echo. Two other things, and I wish I could give her credit, but I have to be careful for confidentiality. Looking for… Let me see if I get this right from my notes. Someone with a bachelor’s in marketing and a masters but it was something like in information systems, right, you know, where it’s basically process, so the marketing and process, or, and this one was really fun, a computer science degree and this person plays music or performs somehow. Matt: You know, I will say some of the best analysts and programmers that I have ever worked with are musicians on the side. Absolutely, that was something that was so consistent, and yeah. Michael: And dance, some type of performance. A flair for the creative side, they know how to perform, they know how to hold an audience’s interest, and I’m thinking back to a lot of the people who moved up through the WPP and OMNICOM agencies that we worked with in the past. And I’m thinking that a lot of the people who moved up were musicians, they were ballet dancers, performers, some of them were street performers, they went out and they loved holding an audience, and they are the people who moved up. Matt: Yes, there was a book a number of years ago that came out that said right-brains will rule the world. And, you know, I’m sorry to say, left brainers, it is a look at me society. And especially in terms of job prospects and job performance, that those who can captivate will get the attention. Because, again, it’s not just captivating in words, it’s understanding how people think and how to approach them, how to present to them. It comes back to what you talked about earlier is that they had ability to present information in a way that persuades and… I got to the point, you know, I realized I’m not just a trainer, I am an entertainer. I provide infotainment because I can give all the information you want, but you will be bored. I can keep your attention longer if I entertain at the same time. And that has become an absolutely essential skill, especially when doing a full day or two full days of training. You know, how do you keep people’s attention for that? And it’s come down to that. That is such a valuable skill and it’s one that I can’t sit back on and just rely on it. It’s what I have to constantly tend to and improve and, you know, how I do my training now is so different than what I used to do five, six, more years ago because of that. Michael: To make sure that we don’t leave out our analytic or linear thought folks, there is high value for folks who can think in that manner and may not need to develop that presentation skill. There are specialist roles abound for this. But be aware that as a marketer or as a data scientist, you’ll probably be able to do your craft without worrying about the persuasion parts, and may not be, you know, as exposed or as put up on the presentation podium as others, which some people prefer, and I actually applaud folks who are in that realm. Matt: Well, it’s funny you should say that because the next…in my podcast plan, a few weeks ago I had Stewart Buley [SP] who…he specializes in storytelling, but more than that, he teaches people how to present with confidence. And he specializes in working with start-ups who are pitching for investment. Now, the vast majority of people are left-brainers. They’re tech guys. And when you see his process and what he does with them, he transforms them into being captivating, telling a story succinctly, and getting their point across. And he’s gonna be on in probably the next month or two to kind of walk through his process and talk about how he specializes in working with those left-brainers. And showing them that you can do this, it’s… As we joked about, you know, in people’s biggest fears, one of the top ones is public speaking, and it tends to rank higher than being buried alive or snakes, which amazes me being a natural at it, but understanding also there are people that have a mortal fear of being in front of people. Michael: Right. Well, so here’s to developing your skills and not being buried alive. Michael: Snakes, I’d go either way on that, but public speaking, if you’re passionate, got something to share, I highly recommend you give it a try. Matt, so I’ll do my little wrap up for the OMCP podcast and then stay on if there’s anything more that you want to cover. Is that okay if I just give that a little spiel right now? Michael: It’s okay. 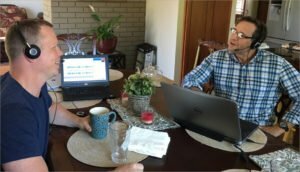 And so that is the time we have today for the “OMCP Podcast.” A big thank you to Matt Bailey, who will be putting this up on “Endless Coffee Cup,” which is his podcast series. You can find that on sitelogic.com. Be sure to pick up Matt’s books, “Digital Marketing an Hour a Day” and “Wired to be Wowed” on amazon.com. And then also we have “Teach New Dogs Old Tricks” on sitelogic.com, and you can always reach out to Matt to have him visit your team for training and best practices in digital marketing at the same site, sitelogic.com. Matt, thanks so much for being part of the podcast today. Matt: Thank you, Mike. Always a pleasure, always fun.